When was the last time you went for a day without your cell phone? Truth be told, most of us are addicted to our phones. Phones are a huge part of our culture, lifestyle and the way we “do business” in 21st century America. Coming to camp, for most, means setting the phone down for the greater part of a week. No texts to answer, no tweets to read, no facebook newsfeed to keep up with. For most, it is surprisingly refreshing to realize that the pressure has been lifted for a few days. Kids are able to relax, unwind and breathe. Staff are able to connect with other staff members and build friendships, relationships, and memories. We all know that when the end of the camp week comes, the notifications, emails, and messages will be there. But what we also realize, is that the world as NOT come to an end and that we actually enjoyed life outside of our phones. I realize that phones these days, are much more than phones. They are our alarm clocks, our shopping list, our workout schedule, our camera, our email, the list goes on. 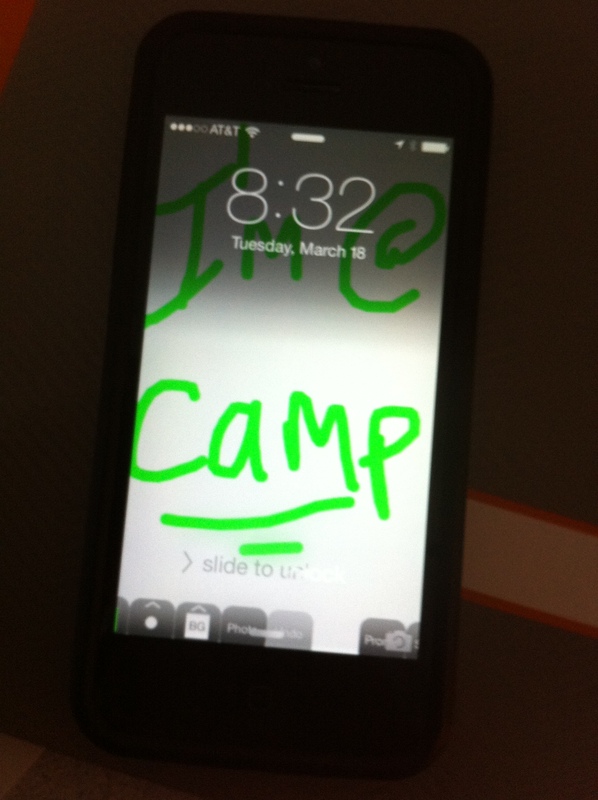 In this world of fast-paced technology, camp gives kids something they can’t get in the outside world. It’s an experience of real conversations, face to face discussions. Above all, you get to experience emotions that can be viewed in the eyes of another person and not in an emoticon. Camp is a place where sitting and not speaking can be all the conversation that is needed. Campers are able to be outside, look up and around them and see God’s Art Gallery. Camp is a place where 30 minutes of Solo Quiet Time actually happens and new sounds are able to be heard. We look and see the tall trees, the glistening river, the sparkling water of the pool. The eagle as it flies overhead and the chirping of the birds as they wake us up early in the morning. At camp, we are in a constant conversation with those around us. Morning brings us the cheerful voices of others who are just as excited to be alive, living life at camp. We work together to accomplish the goal of even cleaning our cabin, when just a few days prior, picking up a few items off our bedroom floor seemed like it would be the end of us. But … we are at camp! At camp, conversations are deeper, memories are more vivid, friendships are kindled quicker and relationships sealed with the timeless cement of summer camp. Without a phone in our hands or back pocket, we are free to talk, laugh and play without the interruption of a text to answer. The Tyranny of the Urgent has vanished for a blissful moment. But we are also able to listen. We can listen to the voice of God through his Creation, through the camp counselor or speaker, through the reading of His Word & through the interaction with His people. Even those staff members that must carry a phone at camp are encouraged to do it discreetly so that the sacred environment of camp is kept intact. Most of us can’t live at camp, and for those that do, camp life is much different when campers go home. How do we return to our “regular life” changed and impacted, but still able to interact and be effective where God has placed us? We can begin by recognizing that we need to control this little black box called the cell phone, and not let it control us. We can put it down, turn it off and experience a little bit of “camp life” at home with our families. In our conversations at work or over a meal with a friend. You did it while at camp, and it can be done outside of camp. How will you bring a little camp life into your home life? Begin by putting the cell phone down … for a time each day and look up, around and outside at God’s Art Gallery that is shouting for us to praise Him! Furthermore turn the phone off and listen to the voices around you, the little people in your life, or maybe the voice of a parent that just wants to hear about your day. When a text comes during church or a coffee date with a friend, choose not to answer it and stay focused on the words that are being spoken. It can be done. Because you did it at camp. That’s the power of camp. This is a guest post by Kimberly Mallory, the program director at Camp Gilead in Carnation, WA.